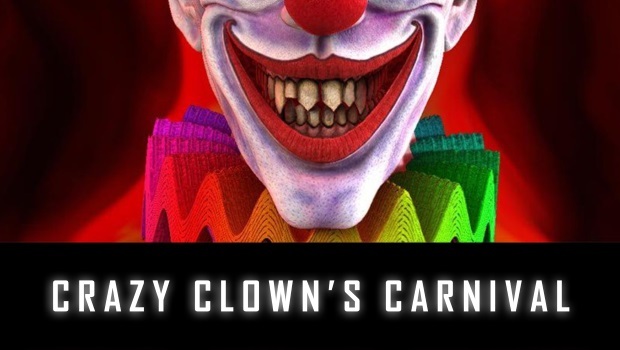 Anyone that saw my face on first entering Crazy Clown’s Carnival will have seen the stupid grin on it – for once there was a game that was living up to its billing and appeared to be delightfully different. The clown has gone mad and won’t let you leave his carnival tent until you’ve completed all his challenges. 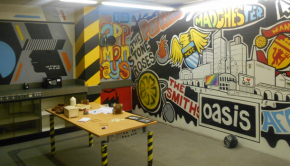 If you’ve played other escape games you can expect something completely different with this one. You’ll need to use all your skill and teamwork to complete the clown’s challenges, and if you enjoy playing games at the carnival fairground you’ll love this! Scared of clowns? Don’t let that worry you, our clown isn’t scary, he’s just a little mad! This game is particularly suitable for family groups as well as groups of friends or colleagues. 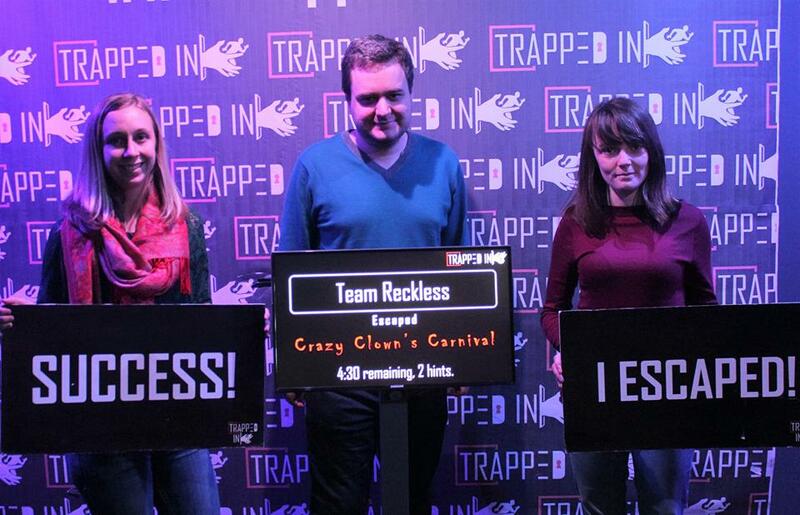 We just assume: okay, it’s a regular escape room with a fairground theme and maybe the odd game taken from a carnival. Not so in this case: Crazy Clown’s Carnival is exactly what it says it is. The room is full of carnival games and not much else. Each has some sort of nasty twist to make them a bit tougher, and your final goal is visible right from the start – you just need to complete the rest of the room to get access to it – and looks like an intimidating ultimate challenge. That also coloured our experience of the rest of the game. For example, one ‘puzzle’ just required finding a very well hidden word and putting it into a word lock. We had assumed the word for that lock was coming from the damn claw machine, and would never have spotted it was elsewhere, were it not just for the fact that we were bored and just looking for anything that might still be relevant, while one member of the team continued to beaver away on the damn claw machine (we had, of course, tried having multiple people on the damn claw machine, working together and so on, but we were at the point where positioning it correctly wasn’t the issue, it was just down to sheer luck if it would hold onto the item once it grabbed it). Which also highlights the other issue with the room: there’s just not enough going on. If it weren’t for the damn claw machine and this well hidden word, the three of us would have been through the room in around half an hour. So while it’s tempting to say the room would have been great if not for the damn claw machine, I can also see us thinking it would have been way too short. The room’s finale, however, was a treat. It’s a huge, imposing, physical test, whose presence has literally loomed over you the entire game. We were only able to beat it through careful teamwork and getting to the end was very satisfying. It took us a good ten minutes and was extremely nerve-wracking as one wrong move could send you all the way back to the start. And since we were starting it with 15 minutes on the clock, that would effectively have meant game over! Of course, the only reason it was this tense was because of the damn claw machine delaying us long enough to create such tension. The second problem is that we loved this puzzle because it involved doing something high up in the room. I’m 5’8 and my team are 5’1 and 5’3. A stool is helpfully provided which I needed for the higher bits, and working together we were passing off control, moving the stool around and helping each other re-position. It felt like a proper team effort. But with a team where every player was 5’3, I’d imagine it’d be nearly impossible, even with the stool. And in a team where you have a player who is 6’0 or taller, they can probably do the entire puzzle themselves while the rest of the team watch. It played out perfectly for us but could be a very different experience depending on your team’s heights! 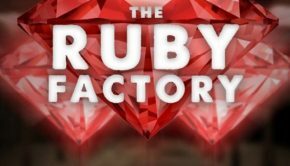 So I love the idea of this game, enough that I’d recommend it for those looking for something different. But they really, really need to improve the damn claw machine. It’s notable that whenever I’ve spoken to fellow enthusiasts about this room (or in one case, just mentioned we’d been to Trapped In to the host of another game) the damn claw machine and how frustrating it was is the first thing that comes up. It casts such a long shadow over the room, and that shadow can’t even be used to help position the damn claw. 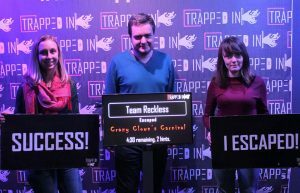 Result – we escaped with 4:30 left, taking two hints. Although one of those hints was just to tell us which ball in the damn claw machine to aim for.